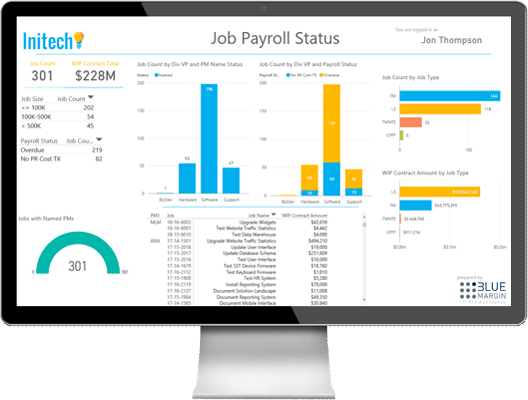 Here are a few examples of dashboards we have built focused on various industries and business functions. We have helped over 100 companies get control of their data and use it to increase efficiency and growth. Blue Margin used data from the Colorado Oil & Gas Conservation Commission (COGCC) to develop better insights into the state's oil and gas production levels. We used Power BI to convert countless spreadsheets into a single set of high-impact dashboards. 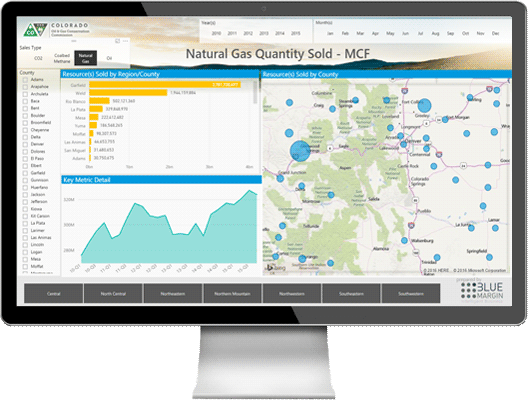 To help the client get control of their data and provide insights to their people, Blue Margin used Power BI and R to develop actionable dashboards. 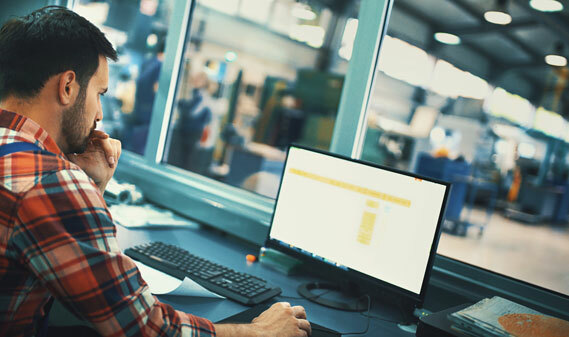 Connecting Initech's project management and accounting systems directly to Power BI enabled real-time insights into critical workload and resource allocation metrics, as well as key financial indicators. 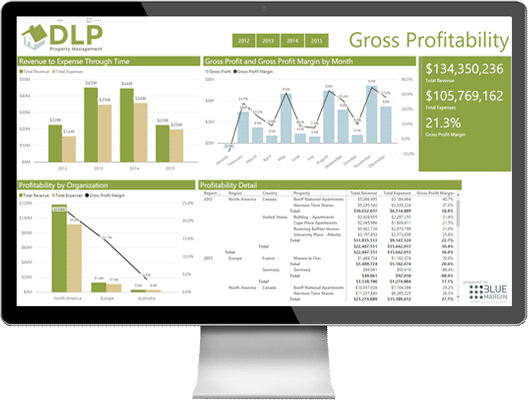 Hearing about Power BI's rapid growth and Blue Margin's knack for creating dashboards that actually drive decisions, a leading CPA firm asked Blue Margin to develop a BI solution for one of their largest clients, DLP Property Management. Blue Margin created a compelling story to help DLP zero-in on high-profitability assets and operational liabilities. The CPA firm looked good and their client's profitability looked even better. Titan Construction is a large construction firm with several offices in the Northeastern United States. Titan works with 3 different property types - residential, commercial, and industrial. 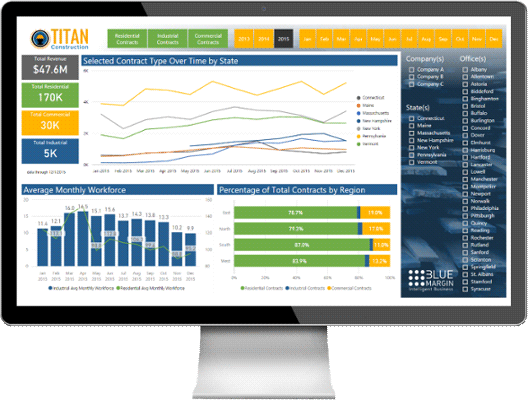 Blue Margin helped Titan gain better insights into their contracting, forecasting, and workforce management levels. Interested in a free proof-of-concept? Drill into your data like you'd drill for oil. One of the most pressing problems in the oil and gas industry is the inability to generate meaningful data, on time. We’ve worked with several industry leaders and have changed the way they do business. Spend more time growing your business and less time figuring out what's holding you back. Let’s build dashboards to better connect you to your employees, your clients, and your business. Finally, a live, interactive scoreboard of your business that provides actionable insights. 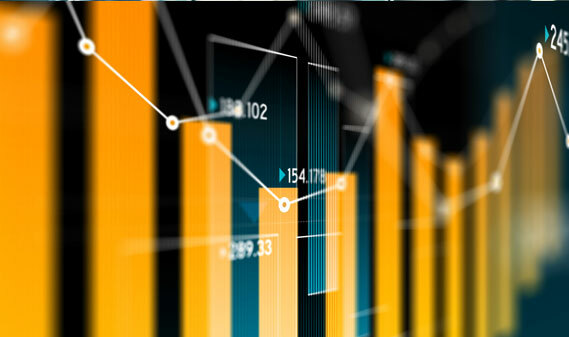 Accounting executives are embracing dashboards for their business and their clients. Let’s do the numbers, better. The construction industry is building fast. It can be difficult to keep up as competitors become more automated and data-driven. Let us help you build a dashboard that brings you all your projects and financials in real-time, wherever you are.